This article was published in the Monroe County Quarterly, Vol. 1, Issue 1, Fall 2004. In accordance to a previous appointment a Council of Brethern met at the house of Brother Lewis Phillips to take into consideration the propriety of constituting a church in this vicinity and the building of a meeting house, and was organized by calling Bro. Hensen Thomas to the Chair and Thos. P. Moore as Secretary. When on motion there was a community of four consisting of the chair Simon Headden, Benjamin D. Phillips and Thos. P. Moore to draft Resolutions for the action of the meeting when the following Resolutions was presented and adopted. 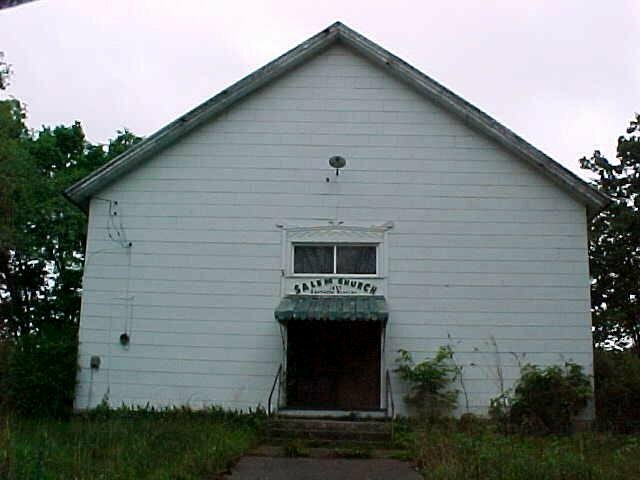 2th Resolved that we will make an effort to build a Meeting House some where between Otter & Crooked Creek in this vicinity which shall belong to the United Baptist but free to any Evangelical Denomination to worship in when not in use by Said Denomination, to be called Salem. 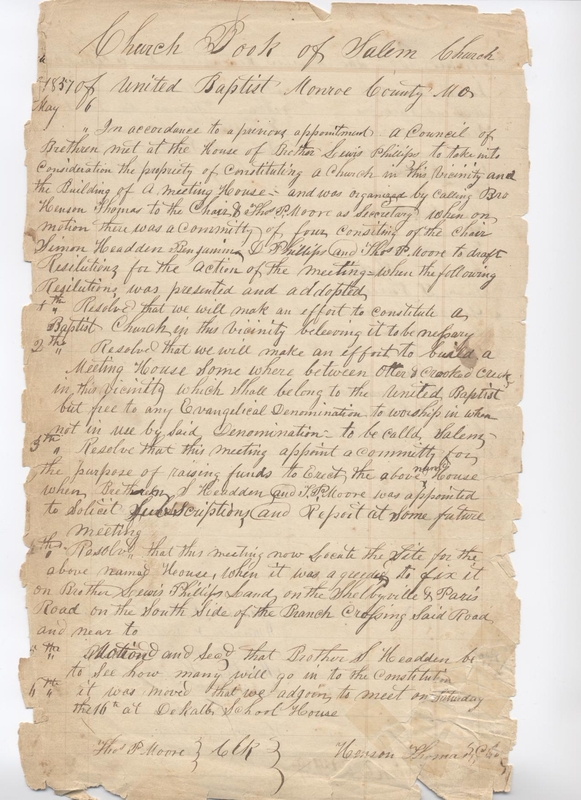 3th Resolve that this meeting appoint a committee for the purpose of raising funds to erect the above named house when Brethern S. Headden and T. P. Moore was appointed to Solicit Subscriptions and reposit at some future meting. 5th Motion and sead that Brother S. Headden be to see how many will go in to the constitution. 6th it was moved that we adjoin, to met on Saturday the 16th at DeKalb School House. It was then moved and sec'd that the following Church Covenant be adopted which carried. As we trust we have been brought by divine grace to embrace the Lord Jesus Christ and by the influence of his spirit to give ourselves up to him so we do now solemnly covenant with each other, that God enabling us, we will walk together in Brotherly Love, that we will exercise a Christian care and watchfulness over each other and faithfully warn, rebuke and admonish one another, as the care shall require, that we will we will not forsake the assembling of ourselves together, nor omit the great duty of prayer, both for ourselves and for others; that we will participate in each others joys and endeavor with tenderness and sympathy to hear each others burdens and sorrows. That we will earnestly endeavor to bring up such as may be under our care in the nurture and admonition of the Lord, that we will seek divine aid to enable us to walk circumspectly and watchfully in the world denying ungodliness and every worldly lust that we will strive together for the support of a faithful Evangelical ministry among us; That we endeavor by example and effort to win soles to Christ and through life amidst evil report and good report, seek to live to the glory of Him who hath called us out of the darkness into his marvelous light. 2th It was then moved that we now elect officers of the Church. When Bros Simon Headden and Samuel P. Willis was chosen for Deacons, and Thomas P. Moore Moderator, Benjamin D. Phillips, Clk. 3th It was then moved that the former site for the Meeting House be confirmed. 4th Brethern, Lewis Phillips, Benjamin D. Phillips and Simon Headden was appointed Trustees of the Church. 5th Bro Thomas R. Thomas, Simon Headden and Thomas P. Moore to solicit subscriptions for the building of the House. 6th Bro. Henson Thomas, Simon Headden, Thomas R. Thomas and Thomas P. Moore was appointed as the building committee. 8th It was moved that our Church days be on Saturday before the third Sabbath in each month which carried. 9th It was moved and carried that all the former proceedings be recorded. 10th It was then moved that we adjourn, to meet on Saturday before the 3rd Sabbath in June at this place.